Very well done, you rock bud! Last edited by Babyboo : 11-18-2005 at 09:07 AM. Is there a way to use only the compass and location? Just looking for the pieces for these 2 if possible. I go to highlight somthing in vault merchandis and click [Search]. It pulls up the browse market window, but finds nothing, and theres no item name in the search field. Thought i'd let ya know it's not working. Very good job on all the rest! woot woot! Last edited by sokadak : 01-25-2006 at 11:57 AM. broker search dont work, per my post from a few weeks ago, think you can fix it by next version? i would like to "steal" your startbutton to use in my custom ui . 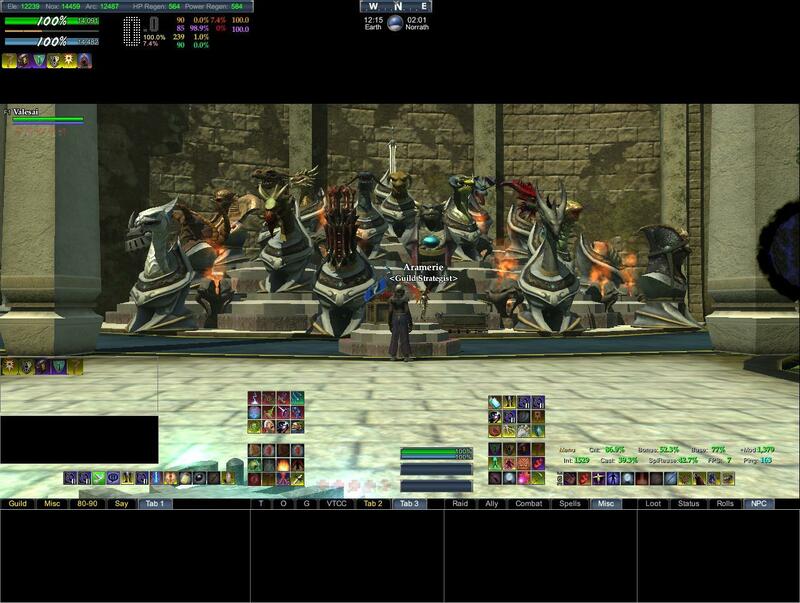 . .
do i just need to copy the "eq2ui_mainhud_startbutton.xml" file into my custom ui, or do i need something more ? Okay, I love the ability to switch settings all the time for graphics, I have a slow computer and this really really helps me. For some reason I can run the game faster at better speeds than with my own custom graphics settings and they also look nicer. The nightvision setting is excellent. This will be the UI I keep using! The problems: the charcters availble for camping w/o char select allways defaults to your two chars even though the file has been properlly edited with my 4th charecter only... when I play my other 3, it works perfectly. The search feature for items in marketboard doesn't work. The food consume on/off button doesn't work. Other than that, it's great! On another note, making a self updating version, which could maybe start eq2 map when it's done updating/checking would be even more awsome! Last edited by TaerinX : 01-21-2006 at 02:02 PM. Love the ui just having problems with the info center none of the text is viewable. apparently with this mod the 4th charecter can only camp to the first two charecters listed in the list for the camp menu. It doesn't display the rest. But the rest displays and camps fine with the first three. Last edited by valesai : 01-21-2006 at 09:47 PM.